Steve Irwin’s Australia Zoo celebrated Bindi Irwin’s fourteenth birthday today with free entry for all children, so we were there (along with most of homeschooling southeast Queensland). This is the first time we’ve been to Australia Zoo, and I was thankful that my dad accompanied us on this outing to lend a hand and provide moral support. This trip about an hour and a half north was the first big outing we’ve taken in our new bus. I packed some extra items as we hoped to stay overnight at a friend’s, and once everyone was in their seats, we were off. The bus is easy to drive and has more power than our horse truck in New Zealand, so it was a pleasure to be on the road again. Finding the zoo was quite easy. Once we were north of Brisbane, the signs kept assuring us that we were on the right road — Steve Irwin Way — and the distance to Australia Zoo. 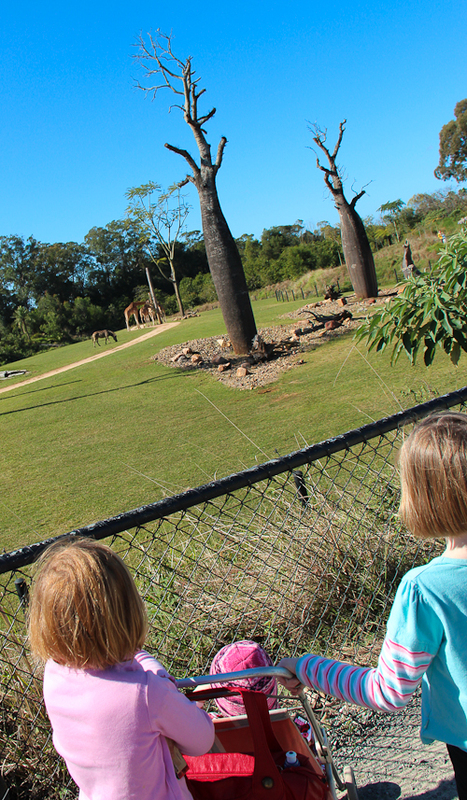 One reason that we haven’t been to Australia Zoo before is because the cost seems way too high. Adult tickets are $59, and a family pass (with three children) is $189. The fact that children were free today is what made a visit especially attractive — well, that and the fact that we wanted to try out our new rig. The first animal we spy is a very lazy rhinoceros lizard sunning itself on a rock. 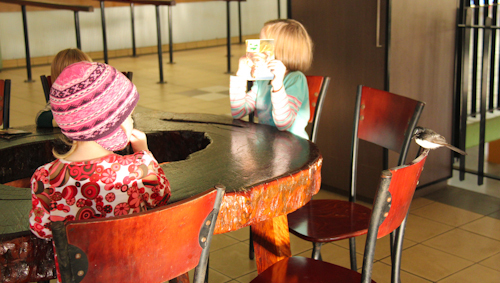 We catch the shuttle bus to the end of the line — the Africa exhibit — and then make our slow way back to where we started. In the shuttle, I realised what an enormous task I have before me in suddenly becoming a single parent. Although my ever-patient dad was on hand to help with the girls, they all wanted to be sitting next to me or on my lap. I just don’t have enough surface area to go around, and so — as a family — we will have to make the necessary adjustments in our attitudes so that no one misses out on attention or affection. 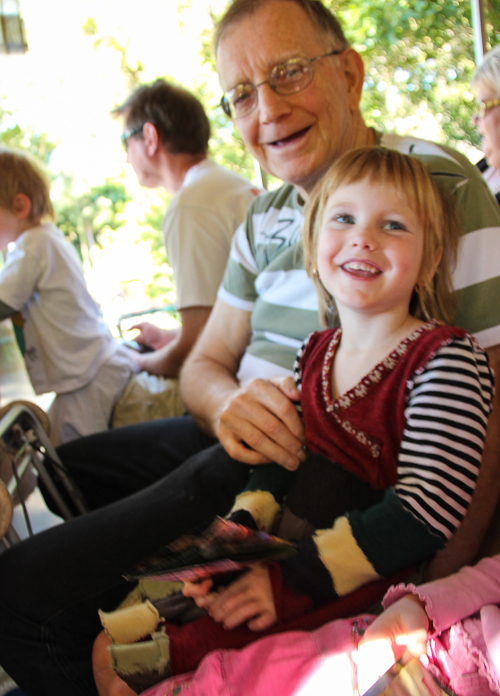 Calista has adopted Pa as her special friend and is happy to sit with him while we ride past the animal exhibits. 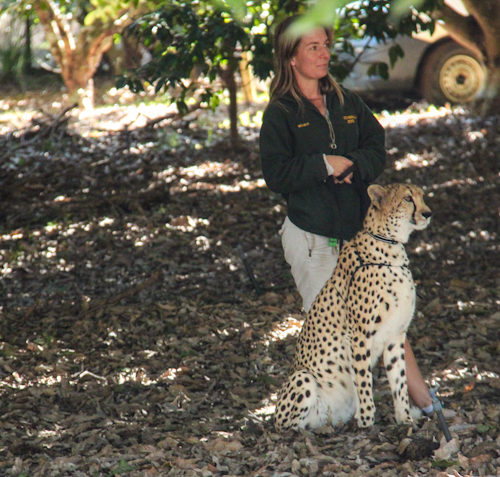 The cheetahs are a relatively new addition to the zoo, and they take their handlers for regular walks in a mango orchard alongside the African animal exhibit. The giraffes, zebras and a lone rhinoceros live together in a big plain. A baby rhino was born earlier this year, but she's not put on display yet. When we reach the tiger exhibit, it’s just in time for the show. 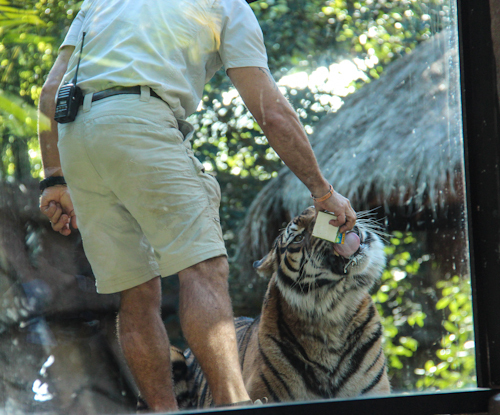 Handlers demonstrate the ways that they train the tigers so that simple medical procedures like checking teeth and taking blood can be performed without knocking the tigers out. 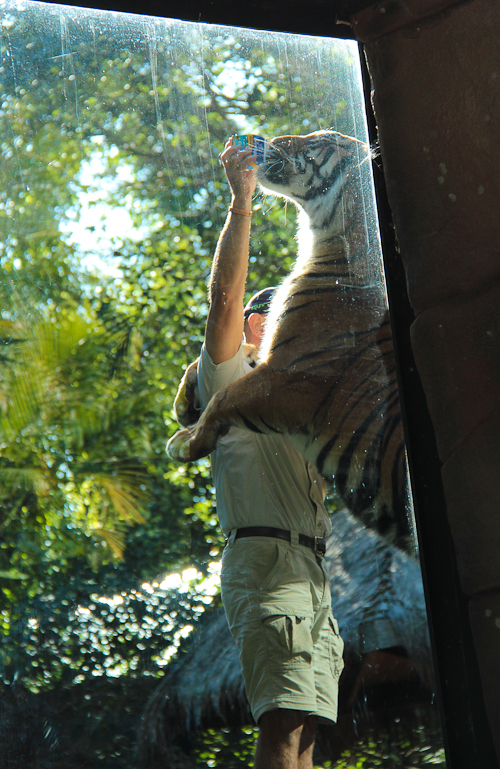 A small carton of milk is used as a reward when training the tigers. Australia Zoo is very proud of the fact that they use reward-based training instead of fear-based training in the handling of their wildcats. 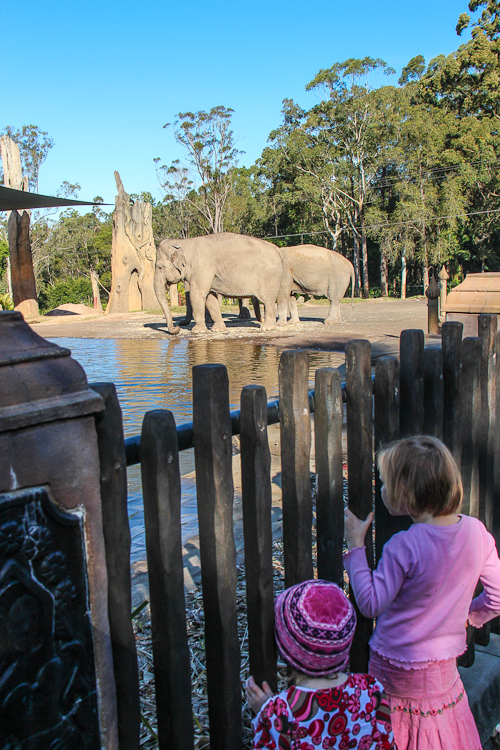 Our girls are more excited by the fountain aerating the water at the elephant exhibit than the actual animals. 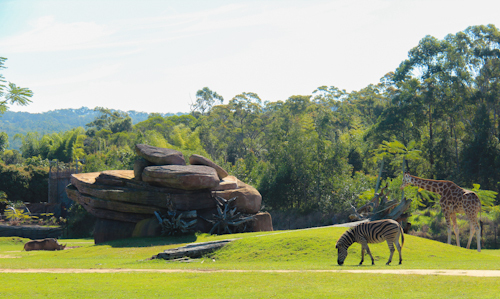 Of course, it wouldn’t be Australia Zoo without a large number of Australian animals. 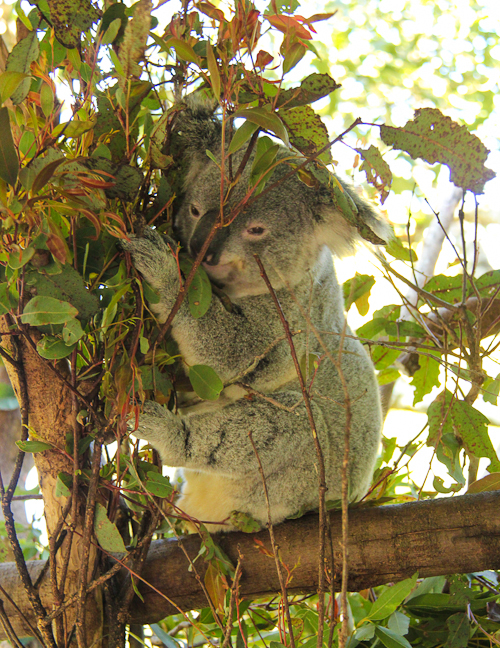 First up, we saw koalas — up close and even touchable! Koalas are nocturnal animas, so I don't know how these ones' natural cycles were adjusted so they would be lively during the daytime. 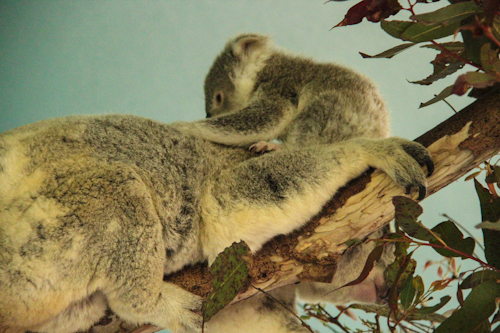 A baby koala with its mummy charms all the visitors by navigating its mothers body despite her seeming indifference to its location as she feeds from the branches on display. The koala is as soft as it appears and not at all smelly! A large number of kangaroos lounge in a park area, and food can be bought and offered to them. When we were approaching the roos, a man came up to us and gave me a packet of roo-food. This small gesture reminded me that we are still a specially-blessed family and can experience the sparkles of generosity wherever we go. Although I sometimes feel like the world has caved in on me, our children don’t need to know this emotional burden. They can grow up in freedom and love, believing that strangers will be kind to us as we are kind to others too. The red kangaroos are very tame, and by this time of the day they were also so well-fed they refused the food we offered. 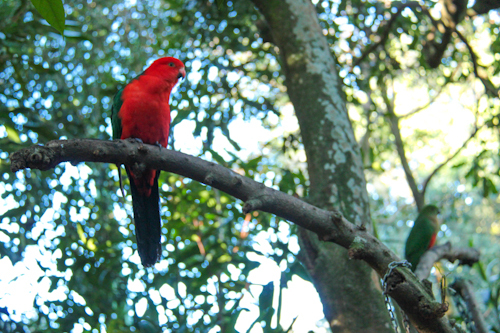 Australia Zoo also features a great variety of native birds. They are contained in a large, netted enclosure, and are easy to approach. If we had been more relaxed at this point of our excursion, we could have spent a lot of time looking at the various birds. But we were hungry, so we continued on quite quickly. This male king parrot outshines his mate (to the right) with his brilliant plumage. At almost six, Brioni is demonstrating a natural aptitude for navigation. 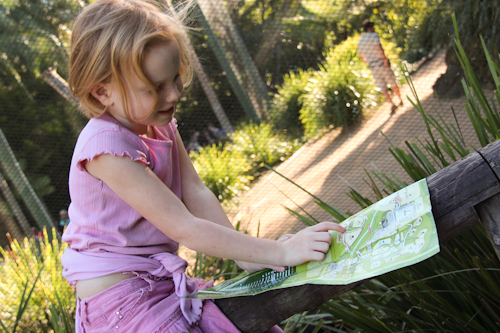 She enjoys using the map to plot our route (to the food-court) as we move around the zoo. 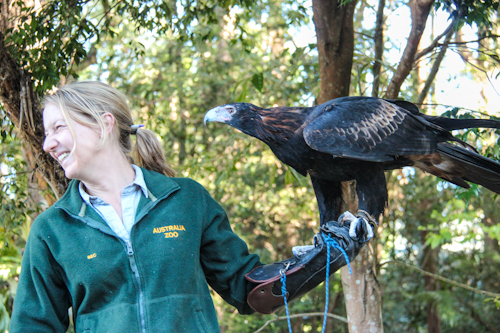 This fabulous bird is a wedge-tailed eagle, and quite a small one, too. They grow much bigger than this. 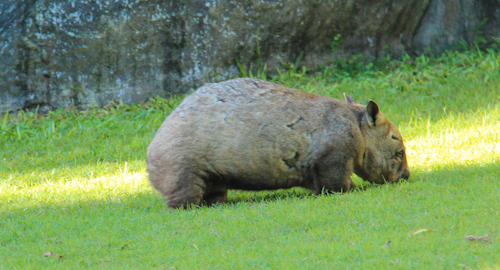 The hairy-nosed wombat is out, grazing on its tidy lawn when we pass by its pen. I'm baffled at how the zoo-keepers have persuaded this nocturnal animal to act more alive in the day-time. 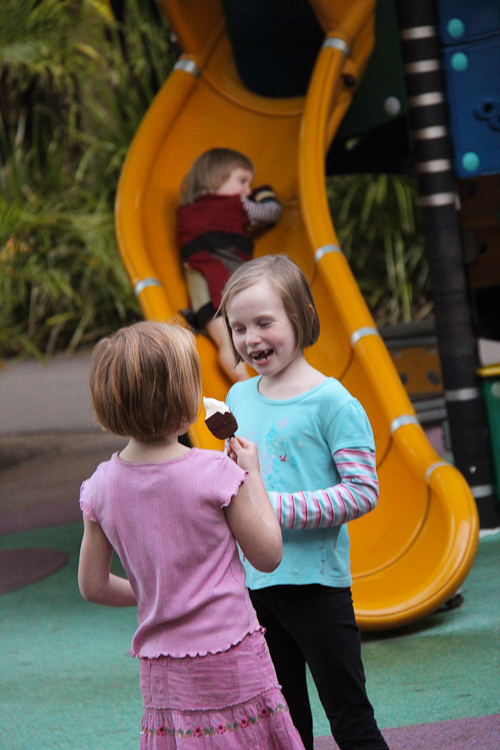 Our girls love the zoo's playgrounds almost more than the animals! 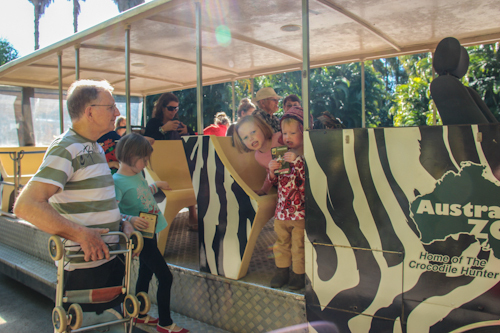 A number of kiddie rides are operating in honour of Bindi's birthday. 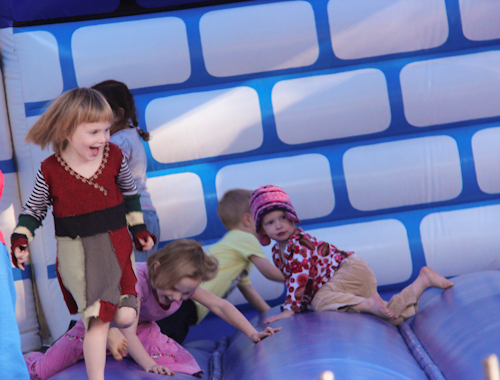 Our girls enjoy the jumping castle together. Finally we reach the food-court, only to discover that the only food we can purchase is the last two remaining cups of hot chips… and ice-creams. Sometimes the hard decisions are taken out of my hands, and it’s ice-creams all around — buoying up the girls with energy and life! A willy-wagtail bird comes and chirps at us as we sit in the food-court. We're startled to discover a snake lurking under the staircase. 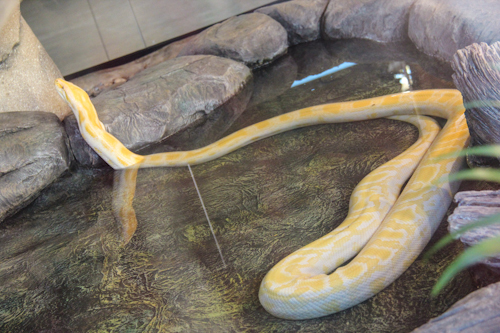 This albino Burmese python is 14 feet long. 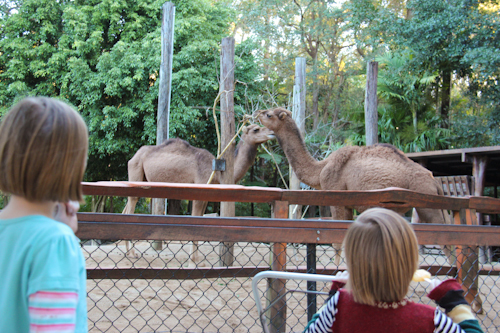 The camels live with a small herd of goats in a very sandy enclosure. 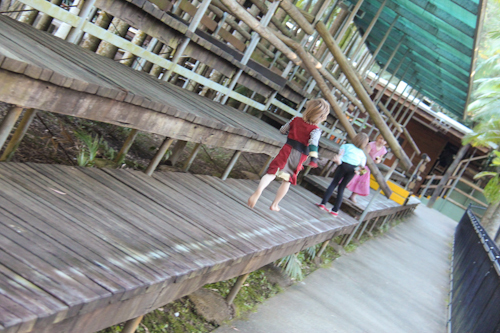 The sugar hit has given the girls a boost of energy, and they start running all over the grandstands near the crocodile pools. When our girls want to stop and play on a playground again, I have to deliberately remind myself that their whole experience of the zoo is what is important, and not just checking off a list of the animals seen. 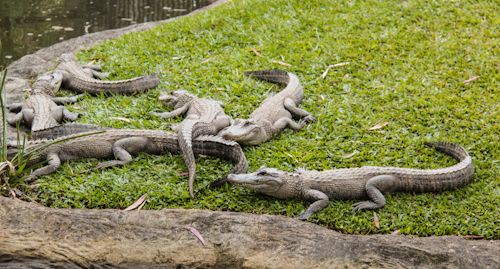 As we peer through the fences, the bigger crocs are hiding from us in their pools, but these smaller fellows are happy enough to be on the bank and give us the feeling of having a "reptile encounter". 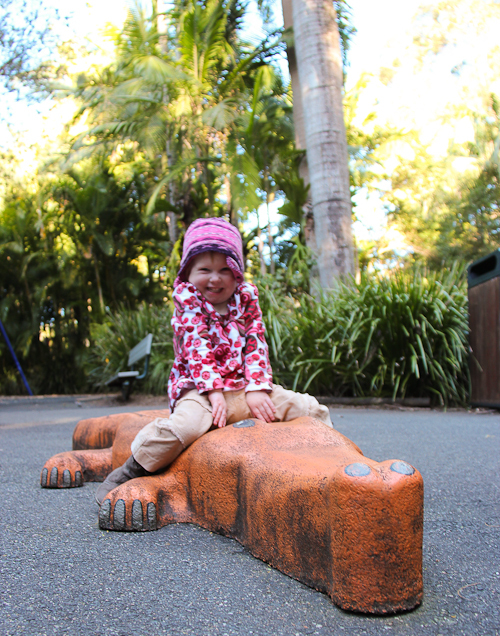 We didn’t see any of the really big shows like the reptile encounter in the “Crocoseum”, but our time at Australia Zoo was a great way to start getting out and about as a smaller family unit. I’m going to make sure I have food with me next time so our girls don’t languish like they did today, and we’ll adjust to having only one adult to pay attention to all four children. All in all, I think I would return to Australia Zoo to see the exhibits we missed. I’m thankful we visited in the winter-time, because I can see how it would be very hot and unpleasant in the summer. As for paying full price to see everything… I don’t think that’s likely — it doesn’t seem worth the money asked for the full price. We’ll wait until we can get free entry for the children again. I’m so jealous that you got to see a wombat awake in the day time! What did Dad think of the zoo? So glad you all had a good day! They might have season passes. Which I know would be very expensive upfront, but then you’d be able to go back as many times as you’d like throughout the season. Our local zoos here do that. Plus there are perks of having pass holders weekends or shows, etc. Looks like such a fun day, glad you all got to get to the zoo. Ha! You are awesome. You got your mom-groove back. 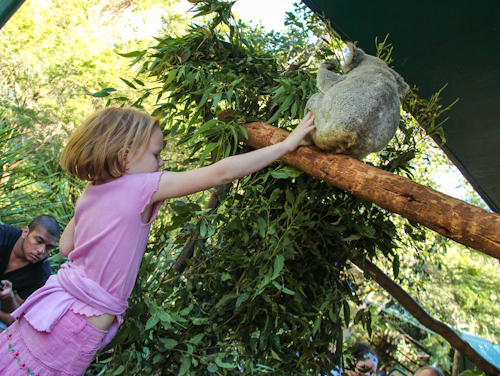 I always wanted to touch a koala. How was the ride in the new vehicle? p.s. every time I read the word sparkling I hear it in my head with an Aussie accent, like SPAH-kling, not spar-kel-ling like we say here. So wonderful to see you all experiencing happy times again! Continued prayers and support. So glad you got to have this day! Looks like so much fun – what a cool zoo! It’s great to see the girls’ smiling faces! Steve Irwin was my boys’ hero when they were smaller. We had to break the news of his death very gently to them and they were devastated! :( It was fun to show them the photos of your trip to “The Crocodile Man’s” zoo, and they were happy to see your family having such a great time there. Seemed like a great day out and much needed ‘fun’ for everyone, although i can only imagine how much work it was for you too especially as a single parent. I’m sure in time, you’ll get into a more natural ‘groove’ with it all and have your ‘tricks up your sleeve’ that will help you mange more easily. it’ll happen, you’ll see! 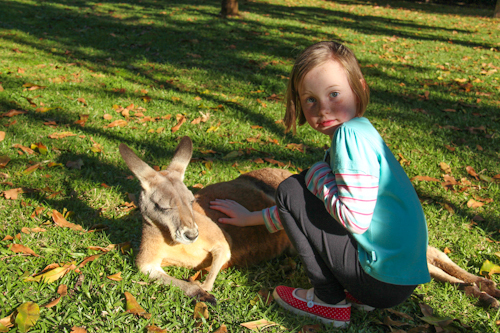 we feel that in general, prices for admissions to things in Australia are prohibitively high for families. but taking advantage of these sorts of opportunities (kids’ free days) can be a good compromise. I’m not lucky enough to be a mum so I am a fairy godmother to my a good friend’s kids (their term as their mum didn’t want to christen them and they wanted to be something to me….so they are my fairy godchildren). Anyway, there are 3 of them. And when they were smaller, they ALL wanted my attention when I visited. (How sweet that they never tired of me despite visiting multiple times a week….not so now two are teens!) I had many meals with one pressed to my left, one to my right, one on my lap and me trying to get to my plate of food! If there had been 4, I guess I would have had to piggy back one for dinner. It’s so lovely that you are being surrounded by that love even if sometimes you might be wanting some space. Forced healing really.